With 6 million acres to explore, the Adirondack Park offers plenty of opportunities for prime leaf peeping each year. In the fall, you won't have to drive far to witness some of the most stunning sights in the Northeast. But where to start? 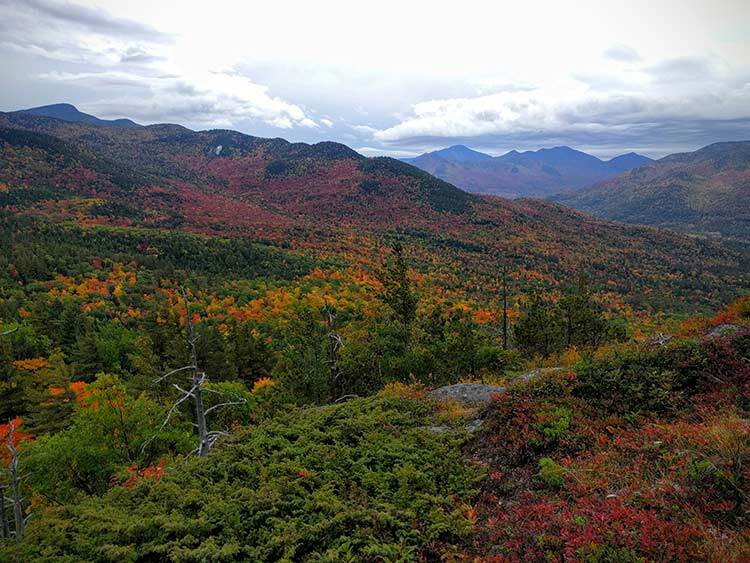 Look no further: here are our go-to fall foliage tours in the Adirondacks. From I-87 Exit 21, travel one mile north on Route 9 and make a left at the state highway entrance. As you make your way up the highway, you'll be able to experience breathtaking views of Vermont's Green Mountains, New Hampshire's White Mountains, and New York's Adirondack Mountains. The 5 ½ mile highway leads to a parking lot where a "viewmobile" will take you the rest of the way to the 2,021 foot summit. Marvel at the 100 mile view while checking out the remains of the world's largest cable railroad and the fireplace of once-thriving Prospect Mountain Hotel. From I-87 Exit 23, head north on Route 9 to the junction of Route 9 and Route 28. Take Route 28, where you'll cross over the Hudson River into Wevertown and North Creek (Gore Mountain Ski Area), and continue along the Hudson River to the hamlet of North River. Past North River, you will exit Warren County and drive through the Siamese Ponds Wilderness Region to picturesque Indian Lake and Lake Abanakee. Make a left onto Sabael Road (Route 30) at Kim's Country Corner and head down a few miles to the State Overlook Rest Area. Take a break and enjoy the incredible views. Take I-87 to Exit 30. Head west on Route 73 through Keene Valley & Keene into the Adirondack High Peaks. As you leave Keene Valley, keep left to continue on Route 73. You'll cut through Cascade Pass to Lake Placid. In Lake Placid, turn right (north) onto Route 86 to head toward Whiteface Mountain and Wilmington. You'll drive along the West Branch of the Ausable River to High Falls Gorge. View the ancient valley of foaming waters, carved by forces of ice, water, and wind complete with a 600 ft. cascading waterfall. From I-87 Exit 22, head north on Route 9N. You'll drive along the Lake George shoreline through Diamond Point and Bolton Landing. Make a pit stop for spectacular dockside lake scenery by turning right at Bolton Library onto Rogers Memorial Park Drive. When you're finished, continue north on Route 9N over Tongue Mountain to Silver Bay. Feel free to make another stop at the state overlook for another grand view. Continue north to Hague and enjoy the views at Town Park. From Hague, head north on Route 9N past Rogers Rock State Park for 12 miles to the roundabout in historic Ticonderoga. On your left you will see The Hancock House, which is the home of the Ticonderoga Historical Society. Continue straight through the circle onto Montcalm St. and through downtown Ticonderoga. The route follows the La Chute River which once powered paper mills and the famous Ticonderoga Pencil Company on its journey from Lake George to Lake Champlain. Today it is home to a scenic village greenspace, Bicentennial Park. From there follow the signs just a few more miles to Fort Ticonderoga, a fully restored 18th century fort built during the French and Indian War. This National Historic Landmark overlooks Lake Champlain. The drive from Hague to Fort Ticonderoga takes about 20 minutes. Head back to Lake George Village by traveling back into the Town of Ticonderoga as you leave the Fort. Just before you enter the town, take the first right onto Route 74/22. Follow Route 74 for 17 miles, passing Eagle Lake and Paradox Lake on the way, until you meet I-87 (The Northway). This roughly one-hour drive back to Lake George will bring you through some of the least developed parts of the Adirondack Park. From Severance, NY it is an easy 35 minute drive south on the interstate back to Exit 22 at Lake George Village. For a more scenic return trip, travel south on Route 9 instead, following the shore of Schroon Lake to Pottersville. From Pottersville, you can opt to get onto I-87 or continue along Route 9 to Chestertown. Start off heading north on Route 9 from Lake George Village. Follow Route 9 through Warrensburg and into Chestertown. You may also opt to begin from I-87 Exit 23 in Warrensburg. Take in the majestic forest scenery along the way before making a stop in Chestertown to explore. Continue on for more incredible views by turning left at the Route 8 Junction to continue on Route 9 around Loon Lake. Past Loon Lake, you'll be able to pick up I-87 at Exit 26 in Pottersville. Begin your trip from I-87 Exit 25. Head east on Route 8 to Brant Lake. You'll follow along the shore of Brant Lake into the Pharaoh Wilderness Area and Dixon Forest. After passing through the lush forest, you'll enter the hamlet of Graphite which leads to a short, winding stretch of road into the Town of Hague. Make a right and head into Town Park for stunning views of Lake George. From its historic and picturesque villages to its iconic lakes and high peaks, the Adirondack Park is a wonderland in the fall. No matter where your journey takes you, you'll be glad you made the trip!